“This is a captivating and important book, minutely researched and vividly narrated, about an isolated Bedouin village where hearing and deaf people alike communicate in sign language. Such situations are increasingly rare and precious. Fox’s book will be fascinating to anyone interested in the nature of human language or indeed in cognitive neuroscience.”—Oliver Sacks, M.D. For the first time, a book for a popular readership takes a look at the world of the signed languages of the deaf—and explains what they reveal about how all language, signed and spoken, works inside our heads. Written by a New York Times journalist originally trained as a linguist, the book combines the exciting popular science of Oliver Sacks and Steven Pinker with the lyrical prose of Tracy Kidder and John McPhee. The narrative of Talking Hands takes readers to a place like nowhere else on earth: the village of Al-Sayyid, a remote Bedouin community in Israel where everyone “speaks” sign language. There, as the result of an unusually high incidence of hereditary deafness, an indigenous sign language has sprung up entirely on its own, used by deaf and hearing villagers alike. At every hour of the day, in nearly every house in the village, in the fields and in the mosque, there are people talking in sign. A veritable island of the deaf, Al-Sayyid is a place that few outsiders have ever seen, and that no journalist has ever before reported on. 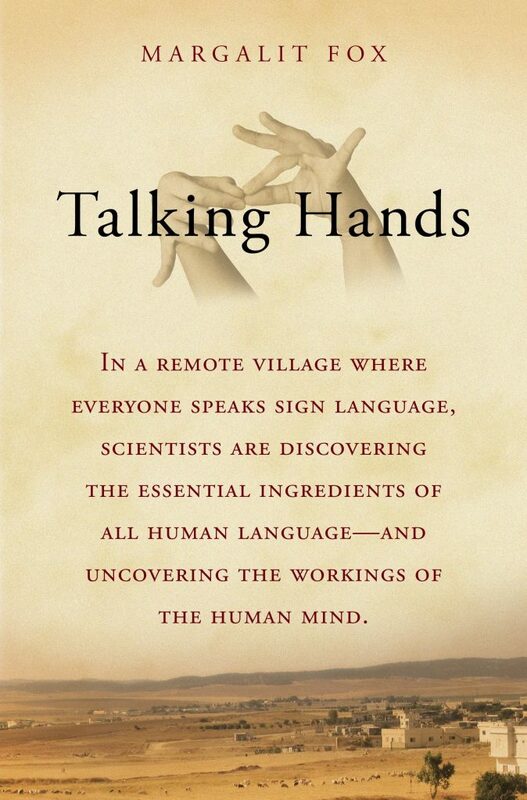 Talking Hands follows an international team of scientists as they set out to decipher this remarkable language. Because the sign language of Al-Sayyid has arisen completely on its own, outside the influence of any other language, it offers a living demonstration of the “language instinct,” man’s inborn capacity to create language from thin air. If the researchers can decode it—if they can isolate the elements that make the village sign language a language—they will have helped identify the ingredients essential to all human language, signed and spoken. And in so doing, they will have illuminated fundamental, long-sought truths about how all language works in the human mind. But as Talking Hands shows, their work is also a race against time, because the unique language of the village may already be endangered. Besides chronicling the work in Al-Sayyid, Talking Hands offers a fascinating introduction to sign language around the world, from American Sign Language to Israeli Sign Language to British Sign Language and many more. In lively, accessible prose, the book explains why these languages are today at the heart of some of the most exciting developments in cognitive science.